OK, so far, so good. All good meals, no snacking, no food-related misery. Some real hunger, but only when it’s close to mealtime – it’s never “oh no, I’m so hungry but I can’t eat”, it’s just “I’m so hungry – oh, time for dinner!” No complaints so far, except a bit of sadness every time I think about chocolate. I’ve replaced any nighttime snacking tendencies by just having drinks at night instead. Not alcohol, obviously, as that’s verboten, but herbal teas, lemon water, and lemon soda water (I ❤ my Soda Stream) have been my go-tos. I might be going to the bathroom an awful lot, but at least I’m realizing that what I really want when I’m bored in the evening is the ritual of preparing something and then sitting down to enjoy it. A cup of peppermint tea works just as well as a snack, and is nice for my still very much lingering cold, anyway. I am finding, as I have in the past while on a Whole30, that I feel like I’m over-stuffing and force-feeding myself at meals, even when I’m only consuming 300-500 calories at once. But if I don’t eat that much, I end up hungry shortly after. I’m guessing it’s because I eat more vegetables when I’m doing the Whole30 thing and combined with a serving of protein it’s just a lot of bulk? I can’t really explain it to be honest. Maybe my appetite’s just still a little off from being sick. Oh, and in the interest of full disclosure about my mental and physical well-being during this (that’s the point, right?) I feel I should mention I’m really overly emotionally raw at the moment and also not feeling too hot, gut-wise. When I say “emotionally raw” I mean “crying in the car because the loud music is overwhelming” type of behavior…this is not all that uncommon for me though, really. It is 100% normal for me to get choked up during, say, the commercials before a movie, simply because my senses are over-stimulated. But usually I can listen to Deadmau5 in the car without acting like it’s the most deep and meaningful thing that’s ever happened to me. I’m guessing that this combined with the painful gut-cramping is just PMS, but who knows…I’m no good at tracking this nonsense. Maybe it’s the food. Speaking of which, on to the eats! Here’s breakfast. 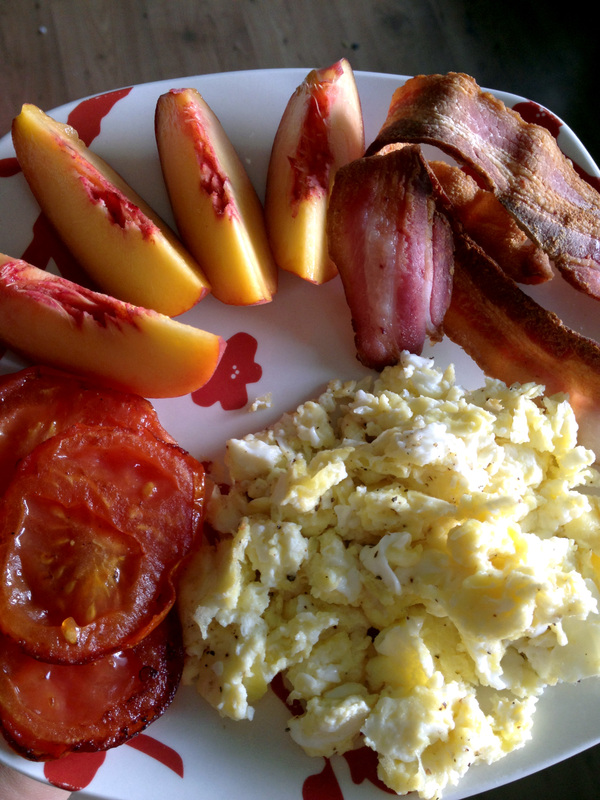 I couldn’t finish the eggs (that’s 2 eggs, scrambled) or tomato (that’s only half a medium-sized tomato). Not sure what my deal is, since I definitely didn’t have any food after dinner the night before. Lunch was only about 3 hours later because I like taking an early lunch at work, for various reasons. I guess it’s mostly a habit from eating out and wanting to avoid the downtown lunch rush at noon. But I still do it even when I pack a lunch, like I did today. This is a leftover pork chop and leftover butternut squash from last night’s dinner. 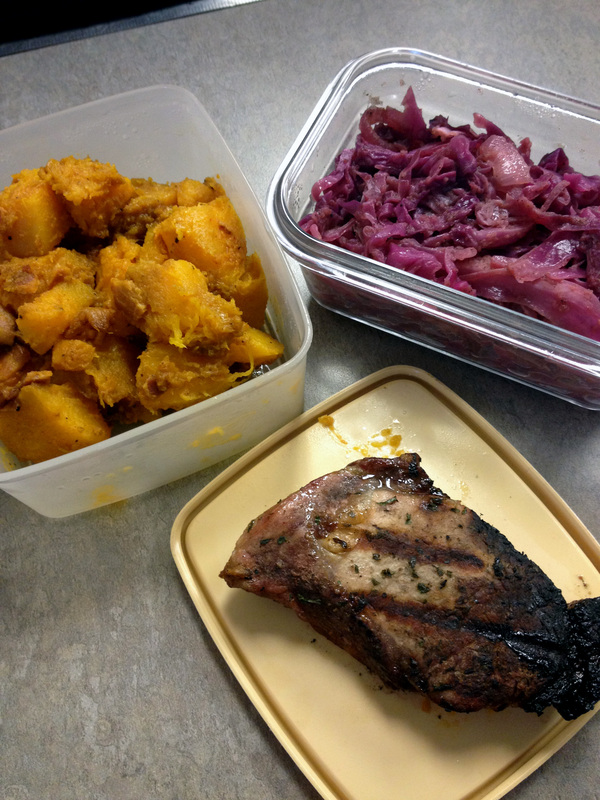 There’s also some red cabbage that I did up with apple cider vinegar, onion, apple sauce, and some spices, but I was really full after eating the pork and squash and didn’t get to it. Will pack it with me again tomorrow I guess! Allan and I were planning to go to my parents’ place for dinner but he came down with the nasty cold I’m in the process of getting over, so he’s nowhere near up to being around other humans. I made a batch of Chicago Dog Chili (from Primal Cravings) so he’d have some dinner, then headed over to Mum and Dad’s with a bag of green beans. Would you believe I forgot to take a picture of dinner? You’ll have to trust me that it was awesome. Mum made this paleo meatloaf and we ate it with the green beans I brought. It was sooo good. And then we munched on some uncannily tasty grapes while visiting after dinner. And Mum even gave me extra meatloaf to take home. Score! Have I mentioned enough times how much I love leftovers? 2 days down, 28 to go. Feeling good about the whole thing. Barring any further Deadmau5-related mental breakdowns, I think this is looking pretty promising. So what’s in Chicago Dog Chile? I’m a chili fan, never liked the beans anyway, so no loss. I also like Cincinnati style with mmmm, chocolate and bacon (yeah, who wouldn’t) But this one has me wanting more; do share at least the ingredients.